Leo Runcible - of Runcible Realty - is too excitable and too pushy. His wife drinks too much. He may be a man of principle, but Liberal Jewish Leo is an outsider in the lilywhite Carquinez, Marin County. When he gets into a pointless argument with a customer over his neighbour Walt Dombrosio's house guests, the resulting ramifications follow a bizarre logic of cause and effect to lead in entirely unexpected directions... And can Leo really have found the skull of a Neanderthal man in middle America? 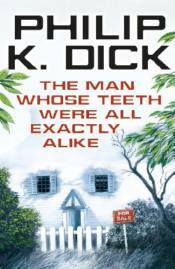 THE MAN WHOSE TEETH WERE ALL EXACTLY ALIKE is a dazzling novel by a writer famous for his power to surprise and delight.